My first graphic novel si about to be published on March 30 in France and Belgium. I called it “Second Generation- Things I never told to my father”. It’s about my childhood in the shade of the trauma of the Shoah, and it ends today. Pubishing house is Dargaud and my editor Gisèke de Haan. Great! 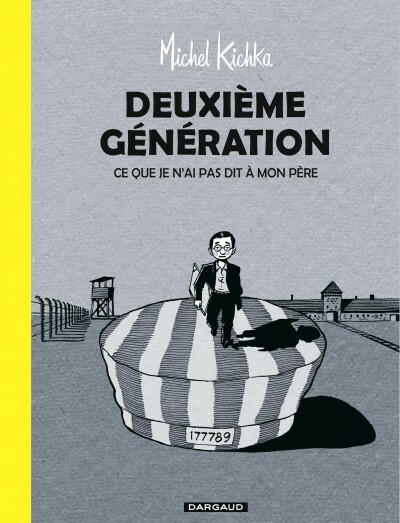 Didn’t realize you are also second generation survivor… Goog luck with your book, Michel. Has your book been translated into english? Not yet but hopefully it will! First, I would like to send greetings from Prague and second, I have a curious question – will your book be published in Czech? Thank you, be well and have a lovely summer! Thank you Klara, the book has been translated to turkish and hebrew and is going to be translated to german and italian, so far. Thank you Klara, I hope it will be! I hope it will be translated into English. I would be very interested in reading it. I was cleaning my studio and found something that reminded me what a great teacher you are and this novel is a reminder of what a great artist you are. Would love to email and see how you are doing. Hi Wolly! Long time! Nice to get your post.Everything’s OK. My mail is: michel@kichka.com. Did hear you in Reshet Bet. Lived in Haifa (aliah) from 1974-79. Look for your book in English! It´s so cool to write a comment on the Site oft the Artist 🙂 AND to get an Answer. Last Night i can´t sleep and I wrote al ittle Article about “Second Generation” on my Blog: http://reingelesen.wordpress.com/2014/12/05/michel-kichka-zweite-generation/ – can you read it in German? When not i can try to translate. It touched me very deply also in my own history. My Story with the Family. I also always read Books about this Time, looking a lot of Films and Documentations. In the last Years i read a lot about the Childrens of War and think about the Generationtrauma which is going from one to the other Generation also without talking about. I don´t know the right words how to say it in English. But i´m very Sad for your Brothers Dead – can i say this like this? I hope you understand it. I think your Book is very very important. Thank you for writing and drawing.